Beautifully patterned foliage and lovely even when not in flower. 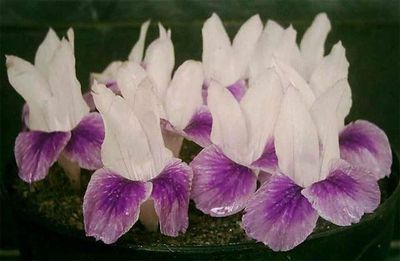 Flowers white with large violet - purple lip, appearing without the leaves like crocus in spring. Excellent for pots and rockeries. The rhizomes are used in the Himalayan villages for it medicinal properties. They grind the rhizomes and make it in a paste and uses it as an ointment for muscle sprain and used as a mixture for healing fractured bones.